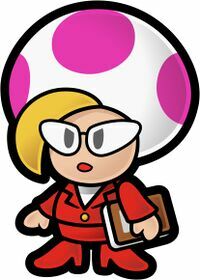 Jolene is a female Toad who resides in Glitzville, and is the assistant of Grubba in Paper Mario: The Thousand-Year Door. She and Grubba work in the Glitz Pit. She first appears at the very beginning of Chapter 3, in Grubba's office. She leads Mario and his partners to their locker room, and then leaves. By talking to Bandy Andy, Mario can discover that occasionally, Jolene had been seen going into places (bathrooms and such), but never coming back out. Mario enters the tournament of Glitzville, and as he advances in rank, some of the fighters start to go missing. He also starts getting E-mails from a strange person called "X". One such E-mail tells him to look in the attic of the building, where he finds the crumpled bodies of fellow fighters King K and Bandy Andy. While exiting the attic, he spies Jolene about to enter, then sees her quickly running out again when she sees him. However, at the end of the chapter, it is revealed that Grubba is actually behind this. After Mario defeats Macho Grubba, Jolene walks in and tells him that she is actually the sister of the old champion of the Glitz Pit, Prince Mush. Prince Mush disappeared, and Jolene suspected Grubba of kidnapping him, explaining why she got a job as his secretary: so that she could learn his secrets. She also revealed that she was actually "X", and had sent Mario the E-mails so that he would unknowingly help her uncover the mystery, as she thought he would be the only one who could defeat Grubba. Jolene without her glasses and suit. She goes on to question the defeated Grubba about her brother, but Grubba says simply that Prince Mush "ain't around these parts no more". Grief stricken, Jolene is surprised when Prince Mush suddenly appears from the Gold Star Grubba was using to power his machine. Grubba had been using Prince Mush to give the Crystal Star more power. Happily reunited with her brother, Jolene grants Mario and co. the third Crystal Star, so that the tragic events caused by it may never reoccur, and goes on to become the manager and referee of the Glitz Pit, taking over Grubba's duties. She appears to be friends with Toodles, as suggested by one of the troubles which Mario can solve. Toodles wants her wrestling magazine back, which Jolene borowed from her. Jolene also has a trouble at the Trouble Center, which involves disposing all the garbage in the storeroom by giving it to Goomfrey, whom she contacted. She says that she could not stand the rubbish's smell and tells Mario to put it somewhere where she could not see it again. When not at work, Jolene can be found at Glitzville's juice bar. The character is never actually confirmed to be Jolene, but it is implied throughout the game, mainly from her recognizable appearance. This would also explain her going into bathrooms and not coming out; she actually just changes her clothes, and no one recognizes her (although it is also implied that she uses a certain "man-eating toilet" to warp from room to room via the bathroom, like Mario did when a security guard locked him in an abandoned locker room). Also, when X tells Mario to get the Super Hammer from Podler in an e-mail, the "Jolene" is not present. "That's Jolene, the Glitz Pit promoter. She's a real strong businesswoman. Boy, I wouldn't want her mad at me, know what I mean? She's all business!" "That's Jolene, the Glitz Pit promoter. She strikes me as a very driven woman. She seems so cold though... would it kill her to be a little nicer?" Kinoshikowa "Kinoshikova", portmanteau of kinoko (mushroom) and -ova, a common feminine ending for Slavic surnames. French Céno T. Pun on c'est noté ("it's noted" in French). The ringtone that plays when Jolene (in disguise as "X") calls Mario on his Mailbox SP is the Ice Land map theme from Super Mario Bros. 3. After Mario defeats Grubba after Chapter 3, Jolene takes over on the Match Reservation System, which was originally run by Grubba. This page was last edited on October 1, 2018, at 20:50.